In all large cities, there are places to escape the hustle and bustle. In Vienna, one of the quietest sites is St. Marx Cemetery. As you enter the gates that are more than two centuries old, you’ll walk up a gently sloping, pebble-lined path surrounded by a beautiful canopy of Chestnut trees. After walking past rows and rows of grave stones, you will come across a large, open, grassy area: the Schachtgraber, or communal graves. Somewhere nearby is where Mozart is buried. 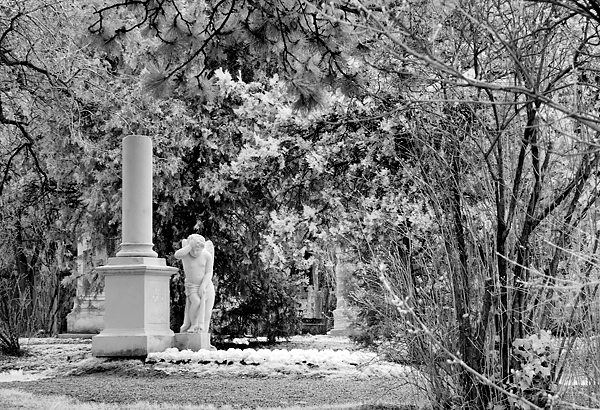 On the left, you’ll see a sign directing you to his monument, an angel in mourning. There could be no better memorial for the wonderful composer who died too young. Unfortunately no one knows exactly where Mozart is buried. The circumstances surrounding this have fueled much speculation and storytelling. Some believe that Mozart was so poor that his family could not afford a funeral. (They could.) Others have said he had no friends and that no one cared. Some have even thought that Constanze was not concerned enough to attend her late husband’s funeral. (She was ill from grieving.) Although we can never learn all the details of his burial, recent research has given us better information. Following Mozart’s consecration at St. Stephen’s Cathedral, his remains were taken in a horse drawn wagon to St. Marx Cemetery. It was not the custom of the day for anyone to accompany a body to the grave site. A few of his friends and students still attempted to travel with the corpse. They got as far as the city gates and had to stop because of the horrible weather and the speed of the wagon. Taking the body to the cemetery was simple and speedy transportation, not a solemn procession. There were four classes of burials in Vienna at the time: first class, second class, third class, and pauper. The pauper’s interment was the same as third class, but required no fee. 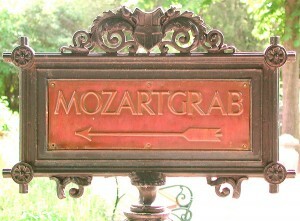 Mozart had a third-class burial. The majority of burials listed on St. Stephen’s death register in late 1791 were third-class. Mozart’s was third class, as was suggested to Constanze in order to save money. The modest burial may also have been keeping with Emperor Joseph II’s decree of 1784, which advocated simple burials in the interest of hygiene and economy. The decree also encouraged sack burials in communal graves and forbade memorial headstones. The policy was later withdrawn because of popular opposition. Unfortunately, that was too late for Mozart. He was buried in an anonymous, mass grave. 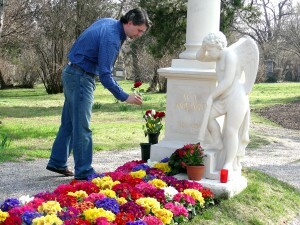 Many music lovers like to place a flower in front of a beloved composer. This is Robert from a 2007 trip. The burial grounds at the time, especially those outside the city limits, were very different from the attractive, landscaped cemeteries seen today. Interment was in rather bleak surroundings. Headstones were only permitted on the cemetery walls. There might have been an occasional bush or tree between rows of plots. Visitation was rare. In the early 1844, Constanze returned to St. Marx to attempt to find where Mozart was buried. The gravedigger from 1791 was now long dead and the graves from that year had been dug up and reused. The bones that had surfaced were reburied. All that could be learned was that graves from that year were probably in the third or fourth row down from the memorial cross. In 1855, another inquiry yielded no additional information, but chose the location for the memorial. Several monuments have been on this spot. The first, from 1855, was moved the Central Cemetery in 1891. Around 1900, a cemetery attendant built another memorial using parts from old gravestones. The memorial today, a mourning angel next to a broken pillar is a simple and moving reminder of Mozart’s premature death. 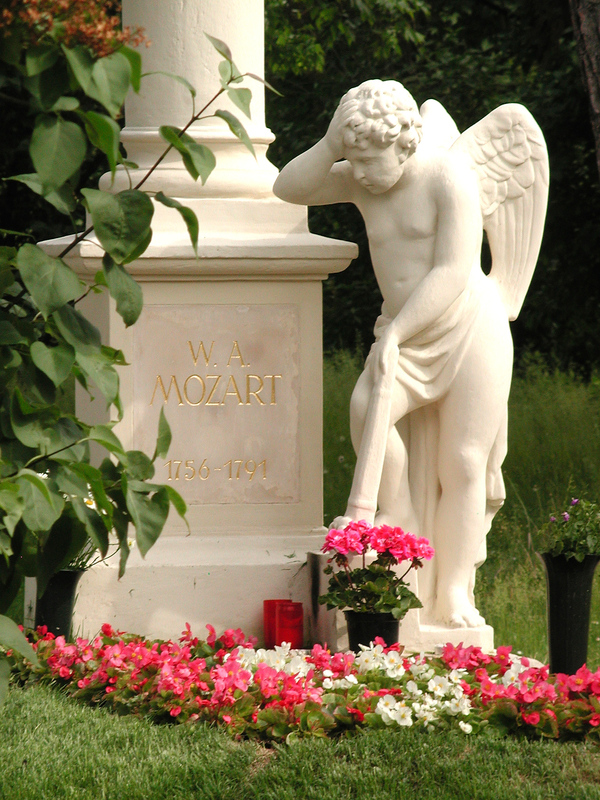 Read about other cemeteries of great musicians that are part of In Mozart’s Footsteps trips. This is a great story. I loved the history of Mozart’s probable decision to have a simple burial and the research that created years to follow. It is interesting how even some of our simple decisions effect people in ways that we never know. Also, that is a great black white picture of the memorial site. Kevin, Thanks for your comment. One of the things I love about visiting that cemetery is walking up the quiet central path, past the rows of gravestones to the open field. When I do that, I know that somewhere here – maybe directly under my feet – is where Mozart was buried in 1791. Although it is sad that he did not have a funeral that matched his contribution to the world, his anonymous burial adds an element of mystique to the Mozart story that captures the imagination. Looking at it in this way, the crying angel monument not only reflects his death at age 35, but it also speaks to the shame of letting such a genius be buried so poorly.